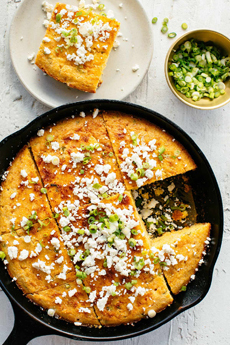 Top: Scallion cornbread from Good Eggs. 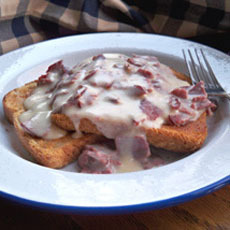 Bottom: Cream Chipped Beef On Toast from RecipeTips.com. Here’s the recipe. We love, love, love cornbread, a specialty of the South that’s hard to find in the Northeast, where we live. Sometimes you’ll get some at a barbecue restaurant or with a dish of chili; but otherwise, you have to bake your own. That’s not a problem. We make four loaves at once and freeze three of them. If you avoid gluten, you can find a recipe that’s all cornmeal. Some cornbread recipes are so sweet, they taste like corn muffins. Not that there’s anything wrong with that, but if you try to avoid unnecessary added sugar, take a look at this recipe from Good Eggs. It uses only one tablespoon of sugar. It also layers extra flavors: scallion, jalapeño, cotija cheese. The heat of the chile bits brings the already-wonderful sweet corn and butter flavors to a new height. We also added corn kernels; the texture adds delight. This recipe, baked in a skillet (you can substitute a round cake pan), requires 15 minutes active time and 30 minutes baking time. 1. PREHEAT the oven to 375°. Using clean hands or a rubber spatula, spread one tablespoon of ghee all over the bottom and sides of an 8-10” cast iron skillet. Fit the bottom of the skillet with a disk of parchment paper by tracing the shape of the skillet on parchment with a pencil and cutting out the circle. 2. COMBINE the cornmeal, flour, sugar, baking powder and salt in a large bowl. Whisk together to blend. Add the milk to the dry mixture and mix well with a fork. 3. MELT the remaining 4 tablespoons of ghee and add it to the batter. Finish by adding the eggs, 1¼ cup of crumbled cheese and most of the scallions, the optional jalapeño and corn. Mix the batter until all of the ingredients are well-combined. 4. GENTLY POUR the batter into the skillet and bake for about 30 minutes, until a toothpick inserted comes out clean. Garnish with the remaining queso fresco, lime and scallions and serve. Corn is native to Mesoamerica, and was used to make flatbread (tortillas) by the Mayas, Aztecs and other cultures. They did not have leavening and didn’t bake loaves of bread. Americans of European descent used cornmeal to make hoecakes and porridge like Indian pudding. They also had no skillets or baking pans before contact with Europeans. The tortillas were fried on hot rocks. Berries, nuts and sunflower seeds could be added. Top: Ghee is clarified butter: The solids have been skimmed off melted butter so the butter doesn’t burn (photo courtesy Ten Speed Press). 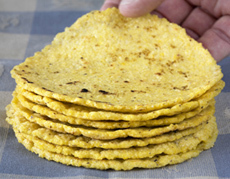 Center: Tortillas: the original corn bread (photo courtesy Anson Mills). 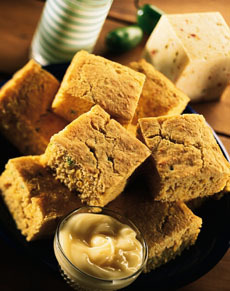 Bottom: Modern cornbread is often baked in baking pans and cut into squares (photo courtesy Wisconsin Milk Marketing Board). Settlers made their version in iron skillets. In the absence of a skillet—not easy to find on the frontier—hoe cakes (hoecakes) were baked on a garden hoe held or wedged up against an open fire. They were eaten with soups or stews. By the 1840s, chemical leavenings such as pearlash (potassium carbonate) and saleratus (potassium bicarbonate) were generally available to American cooks. In 1843, British chemist Alfred Bird invented baking powder (sodium bicarbonate). Modern commercial yeast was not available until the late 1800s, and the granulated active dry yeast we use today was invented during World War II by Fleischmann’s. Finally, all the elements were in place to make modern cornbread. However, as a result of America’s modern taste for sugar and more sugar, most modern cornbread recipes are sweeter than those used by prior generations. Ghee is similar* to clarified butter: It is butter that is melted and strained of its solids. It returns to a soft solid at room temperature. 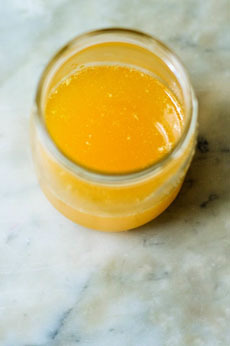 Ghee has less moisture than butter, and for that reason is preferred in some recipes. It is also valuable when you want to pan fry in butter. By removing the milk solids, ghee has a much higher smoke point. But if you’re making cake or cookies, you don’t want to use ghee: The buttery flavor largely comes from the milk solids, and the flavor will milder and less buttery. Ghee is shelf stable (no refrigeration required). It lasts a good while on the shelf, and a very, very long time in the fridge. When you make it, you can make a double batch and stick the extra in the fridge. Or, give it to a friend who cooks: It will be greatly appreciated. *Traditional ghee is made from butter churned from cultured milk, somewhat different from European clarified butter. A few Indian dishes call for using both ghee and sweet butter.